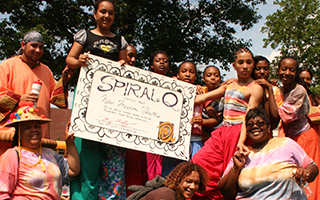 Spiral Q might be best known for producing parades and community festivals rooted in the creative and cultural traditions and practices of the people. These events are designed to create space for creative self- and community expression, spotlight visual, movement, and musical artists and, of course, bring communities together. Annual parades and festivals become beloved holidays, markers of time passed, platforms for pressing issues and showcases of innovative expressions. 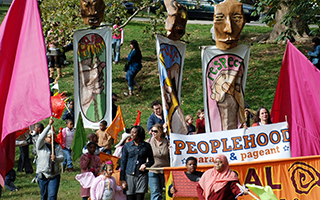 Spiral Q self-produces multiple parades and festivals each year including 15 years of the Peoplehood Parade and Celebration and in-depth work parade-making in Philadelphia public schools. Assembling groups that include neighborhood organizations, business owners, politicians, community leaders, and neighbors Spiral Q leads collaborations that best serve the needs of the communities we are working with. Coming from the belief that we are asset rich when we come together, these events succeed in reflecting collective strengths. 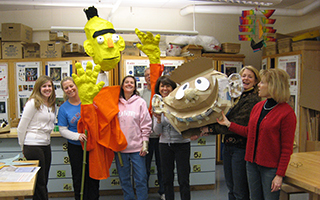 Having produced over 50 parades and festivals over the last 10 years, Spiral Q brings a breadth of experience in producing events, from strategizing tactics for community engagement and cultivation, advising on permit processes, location and route scouting, to creation of parade artwork and performance and public space-making for festivals.